As we searched for stories on the topic of "Why Agroforestry?" for Inside Agroforestry, we heard so many insightful experiences and perspectives that we decided to create two issues. Selecting the right business entity for your farm is like building the foundation of a house. Without the right foundation, the house will falter. Choosing an appropriate business structure encourages you to follow good business practices in accounting and decision-making. Sustainable Agriculture Research and Education (SARE)’s newest book, Farmers’ Guide to Business Structures, provides practical tools to help you choose the best business entity for your operation. Farmers’ Guide to Business Structures is published by the SARE program and was written by Farm Commons with support from North Central Region SARE. Read the full article on the USDA Blog. Community food forests may be best known as a source of fresh healthy food to local residents, but they also offer expanded social connections, reduced food costs, enhanced physical activity, hands-on outdoor learning experiences for children, and much more. Catherine Bukowski will present a webinar on research on community food forests across the United States, highlighting factors that contribute to success and suggesting approaches for dealing with challenges that may arise. Ann Audrey will describe best practices and principles for designing community food forests that are well-adapted to local site conditions and micro-climates. She will also share recommendations for reducing fire hazards and risk in community food forests based on lessons learned during recent fires in the southwestern U.S. This webinar is open to all. 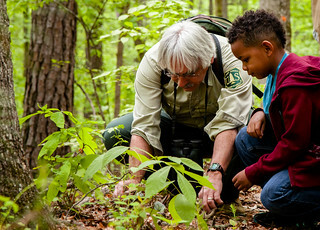 Check out the Urban Forest Connections Webinar Series web page for updates and to watch recordings of previous webinars. The USDA Forest Service has published a new report Agroforestry: Enhancing Resiliency in U.S. Agricultural Landscapes Under Changing Conditions that presents the first-ever synthesis on agroforestry as a mechanism to provide mitigation and adaptation services in the face of a changing climate. With contributions from more than 50 experts from the U.S., Canada, and Mexico, this report draws upon recent science and shows how tree-based management strategies can improve agricultural production and resiliency, especially under increasingly fluctuating environmental conditions. National Agroforestry Center 2017 Highlights Report Now Available! In FY2017, the USDA National Agroforestry Center (NAC) updated AgBufferBuilder, a tool that helps natural resource professionals design cost-effective buffers to improve water quality, worked with Forest Inventory and Analysis (FIA) to inventory trees outside forests for ecosystem services accounting, promoted food security through pollinator conservation, worked with partners to provide opportunities through increased land access, and increased information access through new online resources. These are just some of the highlights found in the National Agroforestry Center: 2017 Highlights report. To read all of the FY2017 highlights, download your copy of the report today! If you have trouble finding a page or encounter any issues with the website, please contact Joseph Banegas, Information Assistant, at josephpbanegas@fs.fed.us. The National Agroforestry Center also has a suite of publications that describe the role agroforestry can play in supporting pollinators. Across America, farmers, ranchers, and forest owners are working with natural resource professionals to integrate forestry and agriculture – and U.S. Department of Agriculture’s National Agroforestry Center (NAC) is leading the way. In Fiscal Year (FY) 2016, the National Agroforestry Center (NAC) was engaged in an array of research and technology transfer activities addressing water quality and other ecosystem services, as well as soil conservation and expanded income opportunities, through an array of agroforestry practices. Take a look at some of the NAC's accomplishments from the previous year. In a NewBIO Webinar on January 17, 2017, Dr. Michael Jacobson, Penn State University Professor of Forest Resources, discussed establishing riparian buffers or replacing row crops with energy crops can reduce nutrient runoff in the Chesapeake Bay watershed. He explored methods such as nutrient credit trading for valuing ecosystem services and various payment options. 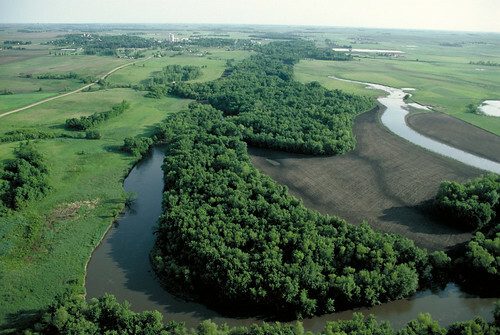 Riparian forest buffers enhance and protect aquatic resources filtering farm runoff and preventing erosion, support wildlife habitat, produce crops, improve water quality, and reduce flood damage. Photo credit: National Agroforestry Center. Much of the beauty in American agricultural landscapes is complemented by the trees in those landscapes. Agroforestry practices support agricultural production and help improve water quality and air quality, soil health, and wildlife habitat. These working trees can also grow fiber, food, and energy. Private landowners, including farmers and ranchers, are in a great position to help conserve and protect our trees and forests. Two new silvopasture resources have recently been released for the northeast US. In 2013, the Pennsylvania Department of Conservation and Natural Resources, the Pennsylvania Grazing Lands Coalition, USDA’s Agricultural Research Service, and USDA’s Natural Resources Conservation Service, utilized grant funding through Northeast Sustainable Agriculture Research Education program to collaborate with Dickinson College on a multiyear project to investigate and apply adaptive management for silvopasture establishment in both woody and open pasture environments. They created a video that features thoughts and reflections of project participants including successes, issues experienced during the course of the project, and thoughts for the future. Joe Orefice, Assistant Professor at Paul Smith’s College, with co-authors John Carrol and Leanne Ketner released A Photo Guide to Northeastern US Silvopasture. This guide is the result of research investigating silvopasture practices on farms in New York and New England. The USDA has released an online interactive training for all types of funders, from traditional financial institutions to nonprofit and philanthropic partners. The training helps funders to understand the work of regional food enterprises that are connecting local producers with local markets. USDA sees potential for investment in businesses in the middle of the supply chain, like local food hubs, processors, aggregators, and distributors. This investment would provide capital for anything from seed money to delivery trucks and sales staff to walk-in coolers. As these businesses start-up or scale-up, they in turn build demand for goods and produce from regional farmers. Learn more at the USDA blog or start the free online training. The USDA and Colorado State University have released a new resource, The Economics of Local Food Systems: A Toolkit to Guide Community Discussions, Assessments and Choices. This toolkit, developed by the Agricultural Marketing Service (AMS), helps communities reliably evaluate the economic impact of investing in local and regional food systems. These activities contribute to USDA's Know Your Farmer, Know Your Food (KYF2) initiative, which coordinates efforts across USDA to support local and regional food systems. These resources may be useful to those working on financial planning, marketing, and food system development for crops and products produced in agroforestry systems. Non-timber Forest Product Calculator now available! A new economic decision-support tool is now available for estimating the income potential from harvesting and selling non-timber forest products from an agroforestry planting. You can download this tool from the NAC website. This tool was developed in cooperation with the Virginia Tech, College of Natural Resources and Environment under a Conservation Innovation Grant from Natural Resource Conservation Service (NRCS) Virginia. Icelandic sheep mowing the orchard floor. Photo by Tobias Carter, Savanna Institute. At Badgersett Research Farm near Canton, Minnesota, Icelandic sheep mow the orchard floor and add fertility for hickory and pecan trees, which in turn provide the sheep shade and shelter. Although a subject of contemporary agricultural science, silvopasture has timeless roots. The word comes from the Latin “silva” for forest, or the Roman deity Silvanus, known for protecting woodlands, fields, and flocks of livestock. Aptly enough, silvopasture integrates these very elements of the farm. The National Agroforestry Center has developed a number of publications that describe the role agroforestry can play in supporting pollinators. “How can agroforestry help pollinators?” is a two-page information sheet that highlights opportunities to recognize, protect, and enhance pollinator habitat. “Working Trees for Pollinators” is a six-page color brochure that illustrates important pollinators for food production and how agroforestry practices can be adapted to meet the needs of both pollinators and producers. The recent issue of our Inside Agroforestry newsletter is titled “Learn How You Can Use Agroforestry Help Pollinators”. Visit our Agroforestry Notes and Pollinators web pages for more information about pollinators and agroforestry. North American Agroforestry Conference Presentations Now Online! The presentations from the 15th North American Agroforestry Conference held in Ames, Iowa in June 2015 are now available online. The report Agroforestry: USDA Reports to America, Fiscal Years 2011-2012 - Comprehensive Version (PDF) is available online. It provides information from 2011 and 2012 on USDA's support for agroforestry told through case studies of farmers and woodland owners using agroforestry practices. The report also outlines the next steps USDA plans to take to support agroforestry and USDA resources that support agroforestry for landowners, natural resource professionals, researchers, and other partners. A short version of the report is also available: Agroforestry: USDA Reports to America, Fiscal Years 2011-2012 - In-Brief (PDF). A new Windbreak Economic decision-making tool is now available for download on the NAC Web site. This economic tool was developed through a partnership of the National Agroforestry Center and the Center for Agroforestry at the University of Missouri. Special thanks to Larry Godsey, Missouri Valley College. The National Association of State Foresters and the U.S. Forest Service have an interactive map of information about Forestry Best Management Practices (BMPs). You can find out if BMP regulation in that state is regulatory, quasi-regulatory, or voluntary. Explore which agencies are responsible for BMP policy development. The International Union of Forest Research organizations, IUFRO, has released a new report, “Forests, Trees and Landscapes for Food Security and Nutrition - A Global Assessment Report”. At the heart of this report is the understanding that forests and trees cannot, by themselves, replace the role of agriculture, but they are critically important to food security and nutrition. Also see the policy brief based on the full report, “Forests, Trees and Landscapes for Food Security and Nutrition - Contributing to the "Zero Hunger Challenge" (PDF). The Urban Waters Restoration Network hosted a webinar in December on “Urban Buffer Restoration - The Answer to Your Urban River’s Problems?” The webinar describes a range of buffer types and uses and shares research about their effectiveness at filtering pollutants, providing habitat, and providing other benefits. It also provides examples of how groups have successfully worked with local leaders and others to get buffers restored or protected. An online toolkit is also provided. More information and a recording of the webinar are available. The microloan changes announced today will allow beginning, small and mid-sized farmers to access an additional $15,000 in loans using a simplified application process with up to seven years to repay. These efforts are part of USDA's continued commitment to small and midsized farming operations and new and beginning farmers. Through the 2014 Farm Bill, cost share and assistance programs are available for organic producers and handlers for certification. Organic cost share programs reimburse individual organic operators up to 75 percent of their certification costs up to a maximum of $750 per category of certification. The USDA National Organic Program Fact Sheet and Frequently Asked Questions can help organic producers and handlers learn more about the programs and how to participate. This eight-part webinar series, beginning August 21, 2014, highlights the remarkable and diverse world of non-timber forest products (NFTP), ranging from an overview of the abundance and diversity of NTFPs to forest farming practices focused on particular marketable products. Non-timber forest products (NTFPs) refer to products other than timber that are harvested from woodlands. NTFPs include plants, parts of plants, fungi, moss, lichen, herbs, vines, shrubs, parts of trees, and other biological material that are either personally used or sold for their commercial value. This series is approved for Society of American Forests (SAF) continuing education credits. Registration and information for each of the webinars can be found on the webinar series flyer (PDF). The call for proposals for the 2015 North Central Region Sustainable Agriculture Research and Education (NCR-SARE) Partnership Grant Program is now available online. This grant program is intended to foster cooperation between agriculture professionals and small groups of farmers and ranchers to catalyze on-farm research, demonstration, and education activities related to sustainable agriculture. The deadline for Partnership Program proposals is October 30, 2014. More information about this and other Sustainable Agriculture Research and Education (SARE) grants available in other regions is available. The 2015 North Central Region Sustainable Agriculture Research and Education Program (NCR-SARE) Research and Education Grant Program Call for Preproposals is now available online on the NCR-SARE's Research and Education web page. The deadline for Research and Education Program preproposals is October 23, 2014. George and Pat Owen’s silvopasture operation was featured on the July 1, 2014, episode of “Out on the Land”. Also watch the season 2 episode featuring Derek Lepke’s windbreaks in the Texas Panhandle. On June 23, 2014, USDA released the new New Farmers website for beginning farmers and ranchers. This resource will allow new farmers to access a centralized location for information on USDA programs relevant to them. It includes information on getting started, education and assistance, access to land and capital, managing risk, protecting the environment, and expanding business. Details on the website and policy changes in support of beginning farmers and ranchers are discussed in a press release. Susan brings extensive experience in technology transfer, working with researchers to communicate research results to managers, land owners, and policy-makers. Much of this work has been accomplished through forming and leading multidisciplinary teams from across the Federal government, as well as from universities, non-governmental organizations, and State governments. Early in her career she served as the International Programs agroforestry coordinator, advising USAID missions on project design and improvement, providing training on project implementation, and synthesizing research. Susan has lead efforts to integrate open space conservation tools and practices into Forest Service programs, and lead the process producing the Forests on the Edge publications which are widely used by planners at all levels of government. Susan has also advised Forest Service field units on compliance with the National Environmental Policy Act, managed the National Forest Stewardship Program, and coordinated a White House Interagency Ecosystem Management Working Group. Her educational background includes a Masters in Forestry (Yale School of Forestry, 1984) and an undergraduate degree in Psychobiology (Mount Holyoke College, 1979). She and her husband Bruce Stein live in Washington DC with their two sons, Noah (12) and Ben (15). Contact Information: Susan Stein, Director – USDA National Agroforestry Center, sstein@fs.fed.us. Agriculture Secretary Tom Vilsack announced a new risk management option that will be available for fruit and vegetable growers and producers with diversified farms. Many agroforestry systems are part of diversified operations. Whole-Farm insurance allows farmers to insure all crops on their farm at once, rather than insuring commodity by commodity. The program will be implemented in counties across the country and will expand in availability over the next several years. The USDA National Agroforestry Center has just released the latest issue of the Inside Agroforestry Newsletter. This issue features locally produced foods, plant a tree of life, the emerging role of food hubs, and steep hills meet steep demand. Agricultural Research Service (ARS) soil scientist Tom Sauer is working to bring more trees to the Central Plains, and he's expanding their role. The State University of New York – College of Environmental Science and Forestry (SUNY-ESF) collaborated with the New York State Department of Transportation (NYSDOT) to install additional living snow fences and conduct research on existing snow fences. Their website provides fact sheets, cost benefit models, training information, research results, and examples relevant to living snow fences in New York State and beyond. In addition, we are launching new, enhanced USDA Agroforestry website, and have established an inbox for our customers to send their questions and comments about the report and USDA’s role in agroforestry: agroforestry@USDA.gov. The USDA National Agroforestry Center working with Virginia Tech University has developed two series of YouTube videos about production of Ramps and Shiitake Mushrooms. These videos are now available through the eXtension Forest Farming website and on YouTube. A big thanks to partners at Cornell University and the U.S. Forest Service Southern Research Station working with VaTech to make these and future videos available. A team of faculty and students from Virginia Tech has won the Casey Trees Master Plan Design Competition out of a field of four finalist teams, which was narrowed down from over fifty initial proposals. The plan includes recommendations from Associate Professor John Fike of the Department of Crop and Soil Environmental Sciences in the College of Agriculture and Life Sciences for three agroforestry approaches to crop production: alley cropping, silvopasture, and forest farming. Windbreaks and Droughts have a long history together in the Great Plains and the story continues even today. The USDA National Agroforestry Center has released two new Information Sheets: What is Silvopasture? and Mitigating Heat Stress in Cattle. This is a new series of single-page publications NAC created this last year to help communicate the value and relationship of agroforestry to address the many issues facing agriculture, forestry and conservation. Ken Mouw, has used a shelterbelt—a band of trees and shrubs—to protect his Elk Point, South Dakota farm against rough weather over the past 10 years. USDA's Natural Resources Conservation Service and the Union County Conservation District helped Mouw design the shelterbelt to protect his farm from the northern and western winds, and keep snow from collecting in his driveway during a snow storm. The May 2013 insert to the latest issue of the National Association of Conservation District's (NACD) “Forestry Notes” focuses on “Island Forestry”. A group of researchers, agency representatives, educators, farmers, and nonprofit consultants from five Midwest states met recently in Ames, IA to discuss the opportunities related to agroforestry. All are part of the three-year-old Mid-American Agroforestry Working Group, also known as MAAWG. The theme of the March 19-20, 2013, meeting was "From Seedling to Sapling: Advancing Agroforestry into Working Landscapes." "I think we're only beginning to tap into the many opportunities related to agroforestry, especially among women landowners, beginning farmers, people on acreages, and farmers with pockets of land less suitable for row crops," said Jeri Neal, who coordinates MAAWG's efforts through the Leopold Center for Sustainable Agriculture at Iowa State University. The Leopold Center hosted the March meeting with support from the USDA National Agroforestry Center. MAAWG member Tom Wahl owns Red Fern Farm in southeast Iowa and agreed that agroforestry information is needed, especially among landowners. "We need to be more aggressive in helping landowners see that they have options to produce a wide variety of woody crops that can compete with the financial returns from commodities like corn and soybeans," he said. Currently, MAAWG efforts are focused in Iowa, Missouri, Minnesota, Nebraska, and Wisconsin. For more information about agroforestry in the Mid-American region, visit the Mid-American Agroforestry Working Group (MAAWG) website. A new article in the January 2013 issue of the Journal Forestry, Opportunities for Enhancing Nontimber Forest Products Management in the United States (PDF, 96 KB), looks at the opportunities and barriers to the management of nontimber forest products, NTFPs, in the U.S. Results from a synthesis of literature related to harvesters and forest managers indicate that many NTFPs have considerable markets but most are inadequately monitored, economically underregulated, and ecologically poorly understood. A new video from the Upper Midwest Hazelnut Development Initiative is available on YouTube. This 17 minute video provides an excellent overview of the work being done by this collaboration of growers and researchers working to develop a sustainable hazelnut industry in the Upper Midwest. This Initiative is also co-sponsoring the Upper Midwest Hazelnut Growers meeting March 1-2, 2013, in Eau Claire, Wisconsin. At the University of Missouri, Michael Gold's $72,484 Professional Development Program grant project is a joint effort among five Midwestern states. It will create an Agroforestry Academy for professional development of natural resource professionals, extension agents, and other educators, to advance adoption of agroforestry as a cornerstone of productive land use in the Midwest. Gold’s project has been named as the 2012 Paula Ford Professional Development Program Proposal of the Year. The European paper, Buffers for biomass production in temperate European agriculture: A review and synthesis on function, ecosystem services and implementation (PDF, 1.4 MB), reviews the biophysical knowledge on buffer functioning and associated ecosystem services. It describes how a three-zone buffer design, with arable fields buffered in combination by grassland, short rotation forestry (SRF) or coppice (SRC) and undisturbed vegetation along water courses, can be incorporated into farming landscapes as productive conservation elements and reflects on the potential for successful implementation. The National Agroforestry Center publication, Conservation Buffers: Design Guidelines for Buffers, Corridors, and Greenways provides the next step by providing specific guidance for designing these features to accomplish multiple objectives including biomass production. The Virginia Cooperative Extension and the US Forest Service Southern Research Station have teamed up to create two new Fact Sheets. These two publications are a result of a demonstration partnership supported by the USDA National Agroforestry Center. They have practical information on native plants and how to include them as an income producing component in conservation practices. Trozzo, K.E., J.F. Munsell, and J.L. Chamberlain. 2012. Native Fruit and Nut Trees of Virginia’s Mountains and Piedmont. Virginia Cooperative Extension Fact Sheet. ANR-23NP. 5p. Trozzo, K.E., J.F. Munsell, and J.L. Chamberlain. 2012. Woody Florals for Income and Conservation. Virginia Cooperative Extension Fact Sheet. ANR-22NP. 3p. Have you seen the new eXtension Forest Farming website? The new Forest Farming eXtension web site is still being developed. But you are invited to ask questions of the experts. Your questions will not only be answered, but they will help build the Frequently Asked Questions section of the website. To give farmers a greater incentive to convert forested acreage into silvopasture, the New York State Senate recently voted to amend the state’s agricultural assessment program to include silvopasturing. A Role for Agroforestry in Forest Restoration in the Lower Mississippi Alluvial Valley (PDF, 2.2 MB) is the cover story in the Journal of Forestry’s January/February 2012 issue. The article explores agroforestry options and their potential to provide both profits for farmers and restore important functions and values of bottomland hardwood forests in a region where about two-thirds of the original forest has been cleared and converted to agriculture. More details available at the Journal of Forestry. EPA is now accepting letters of interest from communities interested in receiving direct assistance for projects that facilitate the use of green infrastructure to protect water quality. The total EPA assistance available through this RLI is approximately $950,000, and will be distributed among 10-20 projects. The value of the assistance available to each project will be approximately $50,000 - $100,000. Letters of interest must be received by April 6, 2012. For more information, please see the Request for Letters of Interest (PDF, 5 pp, 77K). The magazine reported that "(O)ver five years, Douglass Jacobs, a professor of forestry and natural resources, and Martin-Michel Gauthier, a former doctoral student under Jacobs who is now a research scientist in the Ministry of Natural Resources in Quebec, studied the physiology of walnut trees, which are economically significant in Indiana for their lumber and veneer, and in other areas for their nuts. They found that the trees are especially sensitive to particular climates." See the study abstract and preview at: Annals of Forest Science. Photo by Anne Sherwood for The New York Times. HELENA, Mont. — On a forested hill in the mountains north of Montana’s capital, beneath a canopy of pine and spruce, Marc and Gloria Flora have planted more than 300 smaller trees, from apple and pear to black walnut and chestnut. Beneath the trees are layers of crops: shrubs like buffalo berries and raspberries, edible flowers like day lilies, vines like grapes and hops, and medicinal plants, including yarrow and arnica. Turkeys and chickens wander the two-acre plot, gobbling hackberries and bird cherries that have fallen from trees planted in their pen, and leaving manure to nourish the plants. For the Floras, the garden is more than a source of food for personal use and sale. Ms. Flora, an environmental consultant and former supervisor for the United States Forest Service, is hoping it serves as a demonstration project to spur the growth of agroforestry — the science of incorporating trees into traditional agriculture. The extensive tree canopy and the use of native plants, she says, make the garden more resilient in the face of a changing climate, needing less water, no chemical fertilizers and few, if any, pesticides. “It’s far more sustainable” than conventional agriculture, she said. The Department of Agriculture, the Forest Service’s parent agency, began an initiative this year to encourage agroforestry. More attention to forest foods ans services can improve food security in poor nations. The role of forests in providing timber and other wood products must not overshadow their important contribution to feeding many of the world's poorest communities, a group of international forest organizations and secretariats said today. According to the Collaborative Partnership on Forests (CPF), of which FAO is an active member, forests can play an even greater role in feeding the world and helping farmers cope with climate change, but their potential to do so is not being fully realized. Michele Schoeneberger, NAC researcher, is a contributing author of a new report on climate change from the Council for Agricultural Science and Technology, CAST. The report, Carbon Sequestration and Greenhouse Gas Fluxes in Agriculture: Challenges and Opportunities, gives detailed scientific explanations, and examines the causes of greenhouse gas (GHG) emissions, how they might be managed and what the environmental, economic, and policymaking consequences might be. While heated debates about climate change often seem to cloud the issue, science-based research provides clarity and the most credible foundation for decision makers. The full text of Task Force Report 142 is available in hard copy ($50.00, plus shipping) and electronically ($10.00 download fee) through the CAST website.